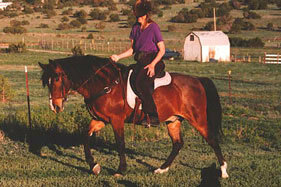 Flair, my gaited mystery horse. To see a large version of each picture, click on it. If you have an idea of what kind of horse he is, please contact me: Carolyn M. Bertin, :, PO Box 1520, Cedar Crest NM 87008, (505)281-9675. Thanks!